A recent Vox article by Timothy Lee is titled: “The end of the internet startup”. In his piece, Lee goes on to explain how today’s startups face a tougher competition from technology incumbents due to two primary factors. First, technology giants acquire early and often. This has become easier lately especially with the help of their large balance sheet (cash) and high enterprise value (equity). There are many successful examples of this that we can point to in recent history: Google purchased YouTube and Android, Facebook acquired Instagram and WhatsApp, Amazon bought Zappos and Quidsi. At the same time, CEO’s of public technology companies have enjoyed unprecedented power in governance, either with the introduction of multi-class shares (à la Facebook and Google) or with the support of shareholders who are willing to look beyond short-term returns (à la Amazon and Tesla). This kind of support enables executives retain their founder mentality and invest for the future; which is why we see incumbents proactively going after “FrontierTech” spaces, such as Artificial Intelligence, Virtual Reality, and Natural Language Processing. These represent the same areas that were previously so risky — from both a technical and market perspective — that only startups dared to venture. Secondly, scaling a tech startup has become more expensive over time. This is a perspective echoed by Andrew Chen, in his piece “Startups are cheaper to build, but more expensive to grow”. Andrew Chen argues that startups have been raising bigger rounds and thereby investing earlier in paid marketing. He also points out that a subset of startups have achieved high LTVs early in their lifecycles, which drove up CAC for the rest of the industry. Smartphone users spend 96% of their app time within their Top 10 most used apps and Smartphone users spend half their time on their #1 most used app, according to comScore. 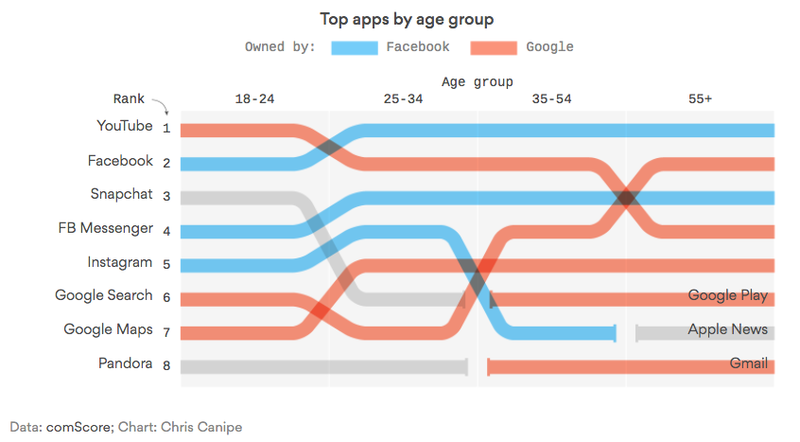 Google and Facebook own the overwhelming majority of traffic to these apps and are the #1 app for every age group. In addition, eMarketer estimates that Facebook and Google are expected to take half of all internet advertising revenue worldwide, and more than 60% in the United States. In the U.S. market, no other digital ad platform has market share above 5%. Given the growth in revenue concentration by these internet giants, the distribution of ads and content on these platforms has become more fiercely competitive and more expensive in parallel. Thirdly, I would add that building a startup has also become more difficult because today’s tech incumbents are keen students of “disruption theory”. “Disruption” describes a process whereby a smaller company with fewer resources is able to successfully challenge established incumbent businesses. Specifically, as incumbents focus on improving their products and services for their most demanding (and usually most profitable) customers, they exceed the needs of some segments and ignore the needs of others. Entrants that prove disruptive begin by successfully targeting those overlooked segments, gaining a foothold by delivering more-suitable functionality — frequently at a lower price. Incumbents, chasing higher profitability in more-demanding segments, tend not to respond vigorously. Entrants then move upmarket, delivering the performance that incumbents’ mainstream customers require, while preserving the advantages that drove their early success. When mainstream customers start adopting the entrants’ offerings in volume, disruption has occurred. The current narrative between Snap and Facebook is a case study for when disruptive innovation may not successfully bring down an incumbent. When Snapchat found success and consumer traction with their mobile app in 2011, Facebook recognized the threat to its core business early on and moved to quickly defend itself. In 2012, Facebook launched Poke, an iOS app for sending expiring text, photos, and videos to directly compete with Snapchat. In early 2013, Facebook started to allow users people to send Instagrams with its Messenger product. In late 2013, Facebook offered $3B to acquire Snapchat, which the latter declined. In 2014, Facebook retired Poke from the app store and launched Slingshot, which also focused on sending ephemeral photos to friends. In late 2016, Facebook launched Stories, disappearing photos, and live video on Instagram. Views on Instagram Stories gain traction and quickly overtake Snapchat by mid-year 2017. Over the past five years, Facebook has employed an iterative fast-follow strategy to not only defend its core business against the rise of Snap, but to also gain ground in turn. It is perhaps one of the few large company to have executed on such a plan, but this example nevertheless demonstrates that large incumbents who have embraced agile development, full product verticalization, and retention of top talent have come to realize that their true defensibility is in their internal processes. Even at their larger scale, incumbents are often out-executing startups. What you ship has become less important than how quickly and how well you can ship it. The nature of innovation has changed: there’s no shame in copying if you can take something and build it better. So, despite increasing competition from fast-moving incumbents, what can startups do? Software eating the world: continue to look outside of Silicon Valley for opportunities to bring the same type of digital innovation to an otherwise laggard industry, such as education, healthcare, agriculture, logistics, etc. Most of the conditions I’ve listed above apply primarily to consumer tech incumbents, so there may still green space in the enterprise tech world. Focus on your core: the best startups already knew that focus is key to success. Today, focus has also become necessary for survival. The more your company can focus on building the core product or value proposition, the better chance you have of getting there first. Invest in the brand: if you are a consumer startup, your brand is now one of your biggest assets against the juggernauts. This is equally relevant for a retail company (ie. Glossier) as it is for a software company (ie. Slack). Keep your enemies close: stay abreast of your competitor’s priorities. This is a good opportunity to leverage your board of directors’ network and also grab coffee with a VC associate to get the lay of the land. Build bridges early: develop corporate development relationships and don’t don’t blow off that email from the corp dev associate. Take the meeting and foster the relationship with the team, either to hatch a partnership together or to lay the groundwork for a future acquisition. What other tips would you give startup founders who are building a startup in the consumer tech space? Let me know your thoughts! Special thanks to Sameer Al-Sakran, Tom Chokel, Yuqing Fan, and Sahil Mansuri for reviewing drafts of this post.